The cave, the bane of your interior design goals, the one room that just won’t lighten up — almost everyone has a room that’s always lacking light, regardless of sunny days. But it doesn’t have to be that way any more. If you’re lacking in natural light but want to give a room a fresh makeover to chase away the darkness, try these tips from ABODO. Probably the most intuitive tip on this list, painting your walls a light color will immediately give any room a brighter atmosphere. Prevent any entering light from disappearing into dark blues, browns, or reds currently residing on your walls, and instead amplify that gleam with light yellow, gray, green, or white. Your ceiling, especially, should be painted a very light color. Naturally, the mirror’s reflective surface — or that of a mirrored statement piece — will bounce around light and add the appearance of openness. Metallic accents on wall-hangings or furniture will have a similar, though smaller, impact. Dark furniture could be exacerbating the room’s lack of light, but reupholstery can be expensive and change the look of the chairs and couches that you so carefully picked out. Instead, opt to drape them with light-colored blankets and pillows, and choose a bright accent rug to bring it all together. Don’t hold back when it comes to lamps — illuminate every dark corner and side table you see fit. But, choose your lampshades carefully. If they’re the traditional cone-shape, they’re directing light downward, which concentrates it on whatever surface it’s standing on and therefore not doing much to make the room feel brighter. Instead, look for cylindrical shades that allow the light to bounce off the ceiling and walls to add indirect light to the entire area. While you’re handling your lamps, swap out dim incandescent bulbs with LEDs or CFLs that are far brighter with lower wattage (and they’ll help your energy bill, too). Look around the room — are the walls lined with trinkets, books, and other decor? Sometimes simpler is better. Reduce a bookshelf to a small selection of your favorites, and display just those. Apply the same process all around the room, and you’ll have more breathing space in no time. If these tips still leave you in the dark, there is one final option (short of adding windows and glass doors): Embrace the darkness and build yourself a cozy room, with deep colors on the walls and plenty of comforts. Either way, you should end up with a room that’s hard to leave. Sorry for the shortage of posts lately; I've been busy. I have projects in full swing and have been working on a new client presentation that I just got back from. I presented a comprehensive design plan for a new construction ranch home that my client recently moved into. After the presentation, the client said something really nice - she said that she never thought her budget would allow her to have a design presentation that looked like it was off one of her favorite HGTV shows. By this, she was referring to the 3D, animated renderings that I created for three of her bedrooms. You've all probably seen shows like Fixer Upper or Property Brothers where the designer reveals animated renderings of what the transformed space will looks like - the client knows exactly what the space will look like and is shocked at the transformation (there are always gasps). With JZID's designer services, this type of design presentation is not just for TV. I will create 3D renderings of your home using Google SketchUp and give you a booklet of paint chips, fabric swatches, and flooring samples that you can keep in order to help you when choosing the final design. Most non-designers find it difficult to really visualize what their redesigned room would look like from just looking at sketches and swatches. By seeing 3D renderings along with fabric swatches, clients are more clearly able to see the final product - with no surprises at the install. Here are two examples of my room designs that I presented today. The space that needs redesigned is a guest bedroom. The client really likes coastal motifs (without being kitschy) and wants the space to be a retreat for guests. As a part of this project, I developed two design concepts for this room. The first is inspired by a more modern hotel feel with a neutral color palette and clean lines, while the second is more rustic and focused on a coffee sitting area. Below are the animated renderings that allow you to take a virtual tour of how the two designs can transform the same bedroom. Curious about what your remodel could look like? Would you like to virtually walk through your new kitchen/bath before diving into the demolition? Contact me today to get your project started. I love to cook, so I tend to spend a lot of time in my kitchen. Right now, my kitchen isn't the most ideal space; there isn't any room for a dishwasher, the countertops don't all match and the laminate isn't in the best shape, but it has quite a large floor plan. One thing that I see as a downfall in the kitchen is that the sink isn't on a wall with a window. I don't have a dishwasher, so a lot of time is spent at the sink washing dishes and staring at a blank wall. To help with the boredom that settles in, I hung one of my favorite vintage prints above the sink for something interesting to look. I made sure the print was well framed with glass so any water splashing up doesn't ruin the print. Typically the spray is pretty tame, so the artwork stays dry pretty much all the time. This is a great addition to your kitchen if you live in an apartment and can't make any serious changes to the walls, or if you live in an older home. A big plus is that the glass over the print is much easier to clean than a painted wall. And best of all, the print adds extra color and visual interest to the room. A common question that I get from clients is whether or not they are crazy for wanting marble countertops in their kitchen. The answer is yes... and no. It's not so straightforward when it comes to this stone. There is no doubt that marble reigns supreme with the high-end elegance it exudes. Despite marble being very trendy right now, the material (especially white marbles) will never go out of style. Marble brightens up any space and easily lends itself to traditional, rustic or contemporary kitchens. It even helps you out when you put your pastry chef's hat on. Marble has a naturally cool temperature which makes it easier to roll out dough without using a ton of flour to prevent sticking. Best of all, marble is priced a bit lower than other natural stones on the market right now since it is commonly found at any of your local distributors. Aside from the definite aesthetic pros, marble is not the perfect kitchen material. Marble is much more fragile than granite or an engineered stone since it is a softer material that is more porous. This makes it easy for the stone to stain or have etching (scratches). Stones are basically just hard sponges, so any liquid sitting on the surface will seep into the stone, staining the marble. This can be easily prevented through proper, regular sealing, using coasters and wiping any spills up quickly. There are even treatments that allow you to bleach out any staining after the fact. Etching, on the other hand, is permanent. Etching happens when any acidic material sits on the surface (like lemon/limes, wine and tomato sauce) and eats away at it causing dull spots. It is an actual changing of the stone itself, like a scratch. It's not really a discoloration; it's a dulling. Check out the image to the right to see what an etched marble surface looks like. There are some things that you can do to help protect the pureness of your marble countertops - regular sealing, wiping off the surface after you cook anything, using coasters and choosing a honed marble over a polished marble (polished will show any etching more obviously). Are marble countertops right for you? I only suggest marble countertops for clients that are prepared to be diligent about keeping the marble clean and dry. The client also has to be able to shrug off any imperfections that happen over the years, as it's impossible to not have some etching after 1 year - 5 years - 10 years. Some people would walk into their kitchen and immediately be haunted by the etching, while other can look past it and just know that any company that comes over will never notice the small things. Feel free to reach out it you want to know more about using marble in your own kitchen. I'm very excited for this long Memorial Day weekend! It's going to be a bit rainy in Milwaukee, so cookouts and poolside lounging may not be in the cards. If we have to stay inside, then we might as well do a bit of fun home-improvement, right?! One of the easiest things you can do to improve your curb appeal is to hang new house numbers. My favorite numbers are from Modernist architect icon, Richard Neutra. His numbers are classic and unobstrusive and it's no wonder that Neutra numbers run about $50 per number. If you have a jigsaw and a little bit of woodworking skills, then you can make your own for around $20 and 90 minutes a set. Check out Curbly.com for a full tutorial. Every room in your home has a purpose, but your home office may be the nerve center of your entire house. If you have a home-based business like I do, then you need a well-functioning space to keep your files organized and you sanity intact. This weekend, take a minute to take inventory of your office and make sure you're set up properly to enable organization. An inbox you can use to put bills, contracts and other paperwork on your to-do list. This doesn't have to be a traditional tray. Try setting up a bulletin board or metal grid to clip paperwork to. Filing to hold current projects. You probably have different folders on your computer to separate projects. Why not do this for hard copies? A filing cabinet is the best way to keep your project folders organized. You don't have to have the classic grey metal cabinet. IKEA and CB2 both make uniquely-styled cabinets that would give your office a polished, modern touch. And a trash can, recycling container and shredder so you don't keep accumulating paper waste that will only stress you out and take up space. We all have utility or flat woven mats in our entryway. These mats work great for wiping off your shoes, but are not always the cutest. 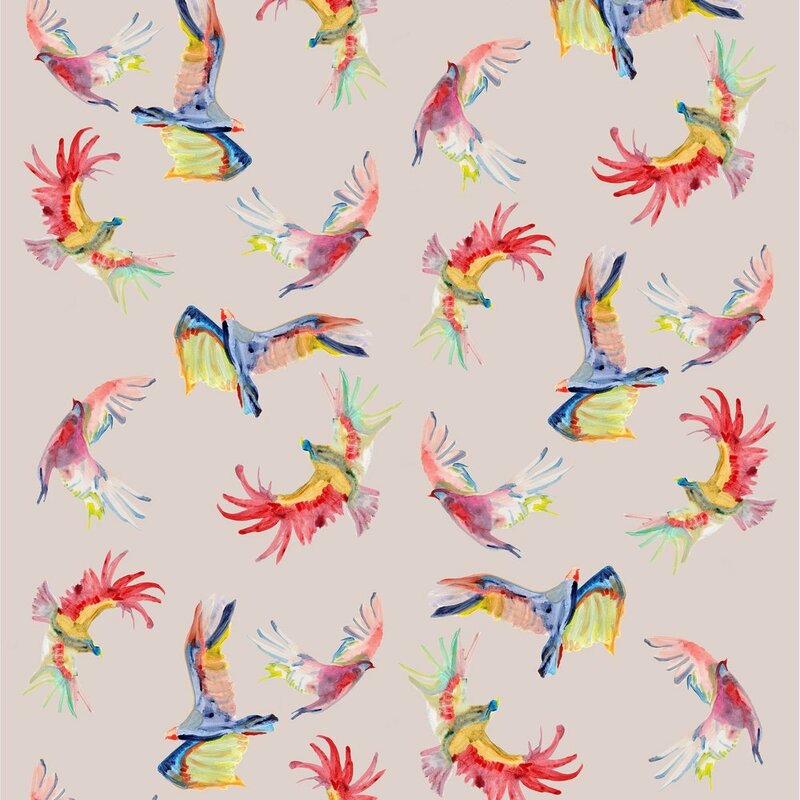 This weekend, tape off a pattern on your rug and use acrylic paint to create your graphic. You can do a tribal pattern, something abstract or use typography to create your statement - the possibilities are endless. One easy way to update the look of your kitchen cabinets, bathroom vanity or dresser drawers is to take off your old knobs and bring in something a bit more unexpected. All you have to do is unscrew the old knobs and replace them. My favorite place right now to get unique, quirky knobs is Anthropology. Painting doorways is an easy way to add unexpected color to your home. This works great if you are a bit color shy and don't want to commit to a color for your entire room. Choose a color that you absolutely love and matches the color scheme that is used in your furniture and decor. Not only will painting your doorway give your room a sense of destination, but the color can be easily swapped out over the years. The quickly approaching Memorial Day weekend is the mark of summer travelling season. This means that people will start descending upon your home. 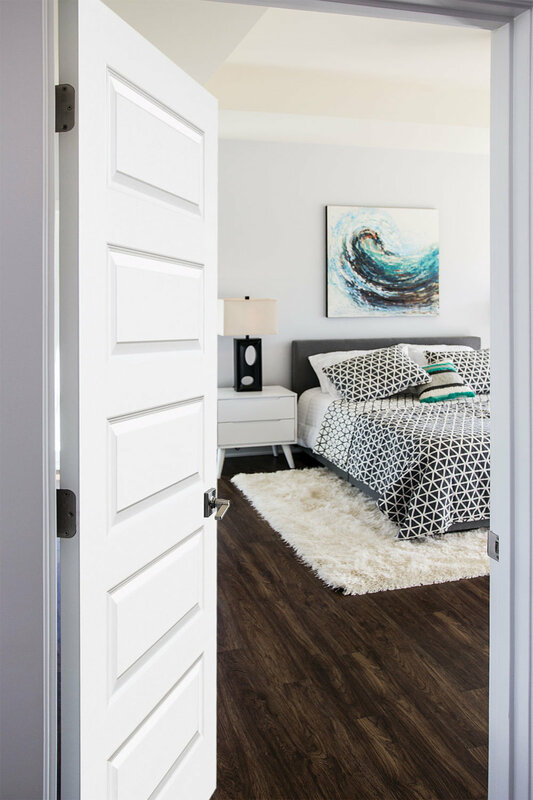 If you are lucky enough to have a home big enough for a guest room, then this is perfect place to create a great impression on the friends and family who temporarily reside there. A lot of us, like the room pictured below, need to use the guest room as a multi-use space. Whether it is a full-time guest space or not, it’s important to keep the room looking its best (clean, fully stocked) at all times for any unexpected guests. To make your guest's stay as pleasant as possible (and to help keep your sanity), I've compiled a quick list of 10 to-do items for your guest bedroom. See the the gallery below. 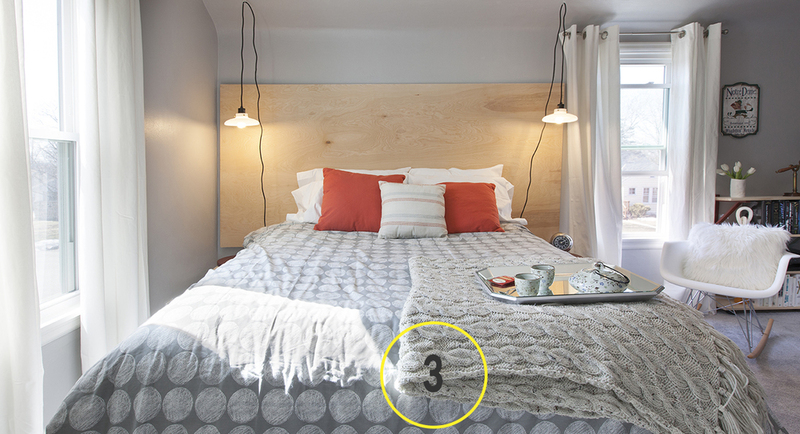 Tip #1: Have unique lighting flanking the bed that can be individually controlled. Everyone's pre-bed routine is different. I like to stay up later than Eli reading so it is nice to be able to have my own bedside light. It's a bigger plus if the light has its own on/off switch that isn't controlled by a light switch that I have to get out of bed to reach. The swag pendant lights in this image are from West Elm. Tip #2: Include different types of pillows. There are no set rules for arranging bed pillows. Anything goes and you can't predict what kind of pillows your guest will prefer. Include 2 sleeping pillows of different firmness (like a memory foam pillow and a down pillow) for each guest. For an added hospitality bonus, include at least 1 extra pillow per guest stored in a closet or drawer near by. As for decorative pillows, add them for pops of color, but don't go overboard. Tip #3: Include extra blankets. This is such a simple amenity, but can make a huge difference in the comfort of your guests. Obviously, guests may need more blankets during the winter months, but always have extra comforters and throws on hand throughout the year. Tip #4: Create a coffee and tea station. When staying the night as a guest, mornings can be a bit strange. What it you need a cup of coffee or tea before putting on clothes and joining everyone for breakfast? One way to help make guests more comfortable is to set up a small coffee and tea station. The ideal guest bedroom is attached to a bathroom or has a wet bar, but if you don't have this ability, then you can deliver fresh water for a kettle or coffee maker so your guests have the ability to make their own beverage if needed. It is much more comfortable for your guests to brew in their own room than have to knock around in an unfamiliar kitchen. Tip #5: Add some additional seating. If you have the space, then add in a comfy chair or settee for your guests to relax. Tip #6: Outfit the nightstand. Give guests a place to keep their electronics. An ideal nightstand would have an alarm clock and a universal charger for Kindle/iPads/Phones. This room has small stools for nightstands. If you have larger stands, then you can include fresh flowers, carafe of water with a glass and an assortment of books you recommend. Tip #7: Don't be stingy with the towels. Leave each guest at least two towels and a washcloth. In this room, I included a basket with the towels but you may want to add a freestanding towel rack if you don't have enough towel bars in the bathroom for all of your guests. 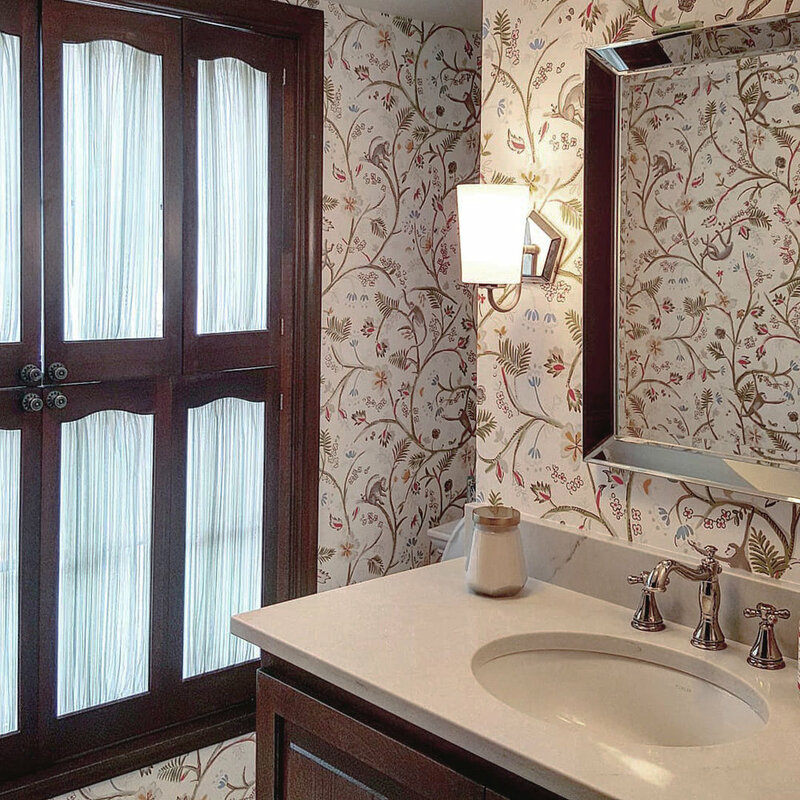 Another tip is to mount a towel bar on the back of the guest room door. Tip #8: Provide amble storage. Some households need to use guest bedroom closets to store overflow clothing. If that is the case in your home, then just make sure that are at least dozen good hangers in the closet and two empty drawers (preferably top drawers) for your guests to use. Tip #9: Provide hotel amenities. One of the major perks of staying in a hotel for a night are the added extras – mini bar, tiny lotions, pillow mints, et cetera. For a thoughtful touch, provide your guests with those little bits and pieces they are likely to have forgotten - toothpaste, mouthwash, face and body lotion, sunscreen, contact case, floss, toothbrushes, a hair brush and comb, band aids, makeup remover, cotton balls, q-tips. Keep these items conveniently placed in the guest bedroom (like in a tray on the dresser) and make sure you replenish the stock after your guests leave. Tip #10: Post your wifi information. Mostly likely, your guests will want to connect to your wifi during their stay. Make this easy for them by posting a sign with your wifi name and password. For this room, I printed out a sign with cute spring buds on it, framed it and positioned it on the guest bedroom dresser. Need help setting up your guest bedroom? Contact me today to get ready for your summer guests! One of my biggest pet peeves is a slow running drain. I live in an older house so clogs are a frequent issue. Some Feng Shui masters even go so far as thinking that clogged drains can deplete finances, health and aspirations and just wreak havoc in general. We all have them, but no one likes a clogged drain. Instead of risking damage to the drains by using Dran-O or spending money on a plumber, I look to my kitchen pantry for a solution. Using a recipe from Tidy Mom, I can keep my drains clear with just three simple ingredients - baking soda, vinegar and water. The recipe below is great for unclogging stopped-up drains or for general maintenance. I like to use this in all of our sinks about every three months to keep everything flowing smoothing. The best part of this is there are no chemicals that will erode your pipes and no negative impact on the environment. Give a shout out in the comments if you have any questions or if you want to share your results. Set small, attainable goals. Let's get real, unless you have a few helpers you probably wont be able to knock off everything from your wish list. So, start small and prioritize so you are less likely to get burnt out. Restock your cleaning supplies cabinet. Throw out any empty bottles that have started to pile up and go to the store to buy any cleaning essentials that are running low. See the Martha Stewart-approved list of cleaners. Take a serious look at your closet. Try to limit yourself to only 40 or 50 hangers. Pack away those heavy winter sweaters and donate clothing items you haven’t wore in the last year. Before you start the deep clean on your bedroom, make the bed first. This will help you see the vision of what a clean room can look like! If you are allergy-prone, then do the vacuuming and dusting in the morning so any dust has time to settle before bedtime. Run a power strip through the back of a nightstand into the inside of a drawer so you can charge your gadgets out of sight. Use fabric softener sheets to dust. They are a cheap substitute for electrostatic cloths, and they work just as well. You can also use orphaned socks as a mitten to dust tight areas and blinds. Work top to bottom when dusting to avoid wasting time going over surfaces twice. Wash your windows on a cloudy day. Sunshine will cause your windows to dry too quickly, leaving streaks. For a fast homemade window-washing solution, mix equal parts white vinegar and warm water. The less stinky solution is to add one teaspoon of mild dish washing liquid to two gallons of water. Use a lemon to clean stainless steel. Cut a lemon in half and rub it on your appliances to remove hard water stains and rust from any stainless steel in the bathroom or kitchen. The fresh, citrus scent is a bonus. Clean out your kitchen cabinets. Wash the shelves and replace any shelf liner that has come up. Try to limit your dish sets to two or three times the required daily place settings. Put additional dishes in storage so you can pull them out when company comes. Disinfect your sponge. If you have a big job to do and only one sponge to do it with (gasp! ), freshen things up halfway through by squeezing it out and microwaving it on high for a minute.